Sean Hannity is shaping up to be a hero to the common man. 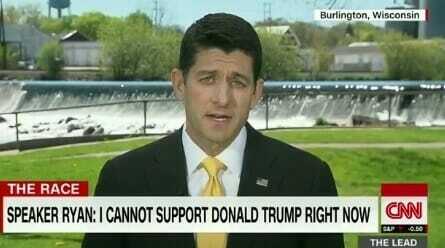 On Thursday Republican Speaker Paul Ryan told Jake Tapper on CNN he was “not ready” to endorse Donald Trump yet. Donald Trump won the GOP nomination on Tuesday after his landslide victory in Indiana. Paul Ryan: Well, uh, to be perfectly candid with you, Jake, I’m just not ready to do that at this point. I’m not there right now. And, I hope to though. And I want to but I think that what is required is that we unify this party. And I think the bulk of the burden to unify the party will come from the presumptive nominee. Then he went on to lecture Trump on being more Reaganesque. Tonight Sean Hannity lashed out at Speaker Paul Ryan.
.@newtgingrich on @SpeakerRyan not ready to back @realDonaldTrump: “He made a big mistake today… He has an obligation to unify the party." ** You can donate to Paul Nehlen who is opposing Ryan in the GOP primary here.